Economy – overview: Poor by European standards, Albania is making the difficult transition to a more open-market economy. The economy rebounded in 1993-95 after a severe depression accompanying the end of the previous centrally planned system in 1990 and 1991. However, a weakening of government resolve to maintain stabilization policies in the election year of 1996 contributed to renewal of inflationary pressures, spurred by the budget deficit which exceeded 12% of GDP. 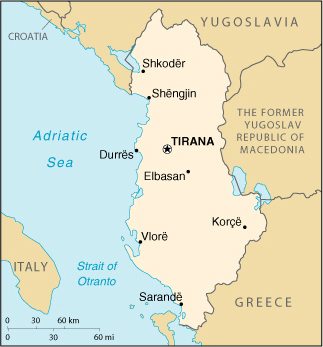 The collapse of financial pyramid schemes in early 1997 – which had attracted deposits from a substantial portion of Albania’s population – triggered severe social unrest which led to more than 1,500 deaths, widespread destruction of property, and a 7% drop in GDP. The government has taken measures to curb violent crime and to revive economic activity and trade. The economy is bolstered by remittances from some 20% of the labor force that works abroad, mostly in Greece and Italy. These remittances supplement GDP and help offset the large foreign trade deficit. Most agricultural land was privatized in 1992, substantially improving peasant incomes. In 1998, Albania recovered the 7% drop in GDP of 1997 and pushed ahead by 8% in 1999 and by 7.5% in 2000. International aid helped defray the high costs of receiving and returning refugees from the Kosovo conflict. Privatization scored some successes in 2000, but other reforms lagged.